Amnes-tea - Back by Popular Demand! 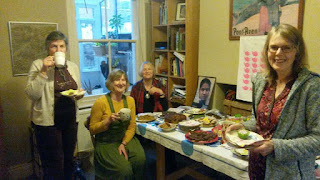 Our last Amnes-tea two months ago was such a success that we are holding another one - to celebrate and support the work of Amnesty International. We hope you can stop by and join us for afternoon tea on Saturday 20 May from 3 to 6 pm at 1 Derwent Mews, Derwenthorpe, York YO10 3DN. There will also be a book stall. All are welcome. Nodjigoto Charbonnel, a human rights defender from Chad, spoke at our monthly meeting in April. Afterwards, we sent emails to Chad's Ministers of Justice and Security respectively urging the Chadian authorities to, among other things, end all forms of intimidation and harassment, in particular by the National Security Agency (ANS), against human rights activists and defenders in Chad. Details of Amnesty International's "Urgent Action" are at this link. Our next monthly meeting takes place on Tuesday 9 May at 7.30 pm at the usual venue - York Friends Meeting House, Friargate, York YO1 9RL. Everyone is welcome to attend.